Hong Kong restaurant Mott 32 has opened its first U.S. outpost at The Palazzo. The 11,715-square-foot space seats 242 guests, with five private dining rooms. Dinner is offered nightly. The name is derived from the address of NYC’s first Chinese convenience store, which debuted in 1891 in Chinatown. The farm-to-table cooking is led by group executive chef Man-Sing Lee and Vegas-based head chef Alan Ji, with a menu featuring applewood-roasted Peking duck, Iberico pork with soft quail egg and black truffle siu mai and crispy triple-cooked Wagyu beef short ribs. Décor, designed by Joyce Wang, who also designed Mott 32 in Hong Kong and Vancouver, incorporates Vegas touches such as a dining table made from a vintage roulette wheel and a chandelier adorned with a feather boa. Mott 32, 3325 Las Vegas Blvd. S., Las Vegas, NV 89109, 866-263-3001. Philadelphia's Vetri Cucina, which celebrates 20 years in 2018, has expanded with a Las Vegas branch in the former location of Nove Italiano at Palms Casino Resort. Unlike the original restaurant, which only serves a tasting menu at dinner, Vetri Cucina Las Vegas offers an à la carte menu with signature dishes such as sweet onion crêpe with white truffle fondue; Swiss chard gnocchi with ricotta salata and brown butter; and salt-baked branzino. 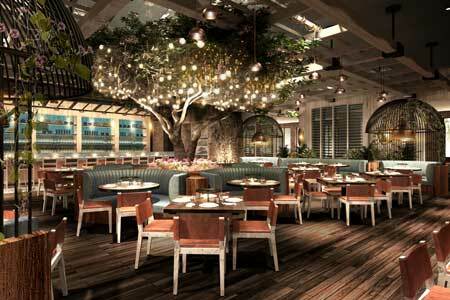 Vetri Cucina, Palms Casino Resort, Fantasy Tower, 4321 W. Flamingo Rd., Las Vegas, NV 89103, 702-944-5900. Television star and restaurateur Lisa Vanderpump and Caesars Palace will partner to open Vanderpump Cocktail Garden, set to debut in early 2019. The new venue will add to Vanderpump’s Los Angeles restaurants and lounges: Villa Blanca, SUR, Pump and Tom Tom. Located between The Colosseum and the entrance to The Forum Shops at Caesars, the Cocktail Garden will have an indoor patio welcoming guests upon arrival, an outdoor al fresco-style garden with towering trees and romantic lighting, and inside, Vanderpump’s signature touches of pink, with contrasting masculine details. The lounge area will feature booths as well as a full bar that focuses on craft cocktails, Vanderpump-branded Sangria and Rosé and a carefully selected wine list. Small shareable bites will also be available. Vanderpump Cocktail Garden, Caesars Palace, 3570 Las Vegas Blvd. S., Las Vegas, NV 89109, no phone. Cipriani, the Italian institution which originally opened as Harry’s Bar in Venice, Italy, in 1931, has made its debut at the new Wynn Plaza. 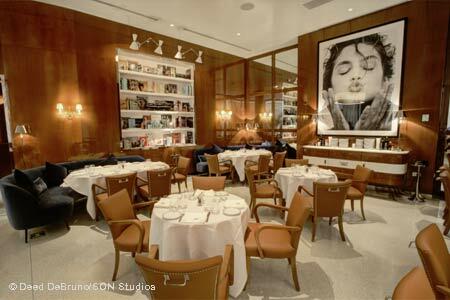 The Las Vegas expansion follows openings around the globe, including New York, Miami, Mexico City, Dubai and Riyadh, and is the first Cipriani location on the West Coast. The décor features a nautical feel with glossy walnut, chrome accents and terrazzo floors. The menu includes signature classics such as carpaccio alla Cipriani, baked tagliolini with ham and vanilla meringue; and the bar serves the original Bellini, which was invented at Harry's Bar in Venice. Cipriani, 3131 Las Vegas Blvd. S., Las Vegas, NV 89109, 702-770-7000, 1-888-320-WYNN. Su Casa is now open at the Silverton Casino Hotel, nestled inside Mi Casa Grill Cantina. The new restaurant-within-a-restaurant offers fresh coastal Asian-inspired favorites with Latin influences. Highlights include yellowtail ceviche with spicy coconut broth; an ahi tuna poke bowl with toasted macadamia nuts and Maui onions; a West Coast sushi burrito with spicy tuna, crab, tempura shrimp and eel sauce; a Su Casa sushi roll – eel, tuna, avocado, cucumber, unagi sauce and chipotle aïoli; and Get in my Belly ramen with soft boiled egg, char siu pork, applewood smoked bacon, bean sprouts and sesame seeds. Complementing the Asian fare are an extensive saké list, Asian beer selection and specialty cocktails, like the Osaka Painkiller with Suntory Toki Japanese whiskey, cream of coconut, pepper-infused orange juice and pineapple juice. Su Casa is open for dinner from 4 p.m. Mon.-Thurs. and for lunch and dinner from 11 a.m. Fri.-Sun. Su Casa, Silverton Casino Hotel, 3333 Blue Diamond Rd., Las Vegas, NV 89139, 702-263-7777, 866-946-4373. Strat Café & Wok is now open at Stratosphere Casino, Hotel & Tower. The 24-hour 4,465-square-foot restaurant is situated on the casino floor, and its décor is inspired by the neighboring Downtown Las Vegas Arts District, with pieces by local artists adorning the walls. The menu, created by Golden Entertainment executive chef Johnny Church, features home-style favorites and traditional Asian cuisine, with breakfast selections such as cornflake-crusted french toast stuffed with peanut butter and mixed berry compote; a variety of sandwiches and burgers including a double-double hangover burger with crispy bacon, fried egg and American cheese; entrées like seven-layer lasagna with white wine sauce and pan-seared chicken breast with ratatouille of zucchini, squash and tomato; and a traditional Asian menu, offered from 11 a.m. to midnight, with highlights including orange chicken, Mongolian beef and spicy peppered prawns with Szechuan sauce. Open 24 hours. Strat Café & Wok, 2000 S. Las Vegas Blvd., Las Vegas, NV 89104, 702-380-7777. Catch, known for attracting A-listers from around the world at its locations in NYC, Hollywood and Playa del Carmen, has opened a Las Vegas outpost at Aria Resort & Casino. It’s situated just off the main lobby in the space formerly occupied by BarMasa and Tetsu. Décor features a lighted walkway with greenery, olive trees in the dining room and tones of teal and azure blue. The menu features a raw bar; sushi; nigiri/sashimi; vegan dishes; branzino, swordfish, Cantonese lobster, tuna, scallop, octopus, mahi mahi and snapper; porterhouse, American Wagyu and New Zealand rack of lamb; and s’mores pizza, sticky coconut cake and vegan pistachio “cheesecake.” The beverage program includes an extensive saké, tequila, bourbon, Cognac, whiskey and Scotch selection; and cocktails like the Pineapple Trainwreck with Belvedere, pineapple, tarragon, lemon and Peychaud’s. Catch is open daily for dinner from 5:30 p.m.-11 p.m. and the lounge is open Thursday-Saturday from 10 p.m. to 3 a.m. Catch, Aria Resort & Casino, CityCenter, 3730 Las Vegas Blvd. S., Las Vegas, NV 89109, 866-359-7757. Two restaurants at The LINQ Promenade are offering packages for a meal and ride on the 550-foot High Roller observation wheel. The Gordon Ramsay Fish & Chips + High Roller combo ticket, available daily from 11:30 a.m. to 6 p.m. for $30, includes one ride and a choice of fish, shrimp, sausage or chicken with chips and one soft drink. The Flour & Barley + High Roller combo ticket, available daily from 11:30 a.m.-2 p.m. for $55, includes one ride and one pizza; signature cocktail, house wine or draft beer; and a choice of dessert, meatballs, side salad or calamari. To purchase combo tickets, visit HighRollerLV.com. The LINQ Promenade, 3535 Las Vegas Blvd. S., Las Vegas, NV 89109, no phone. MB Steak at Hard Rock Hotel & Casino will welcome rodeo fans with a bourbon flight served throughout the National Finals Rodeo (NFR) from Thursday, Dec. 6 through Saturday, Dec. 15. The flight, priced at $29, includes 1-ounce pours of Angel’s Envy, Four Roses Single Barrel and Old Forester. In addition, for $18, offered will be the Smoke and Mirrors cocktail, made with a barrel-aged mix of Templeton Rye, St. George Bruto Americano and Punt e Mes garnished with orange peel and a cherry; before it’s served it is placed into a smoke box and smoked for approximately 15 seconds with hickory chips for a bold, smoky flavor. Executive chef Patrick Munster suggests pairing the cocktail or bourbon flight with the restaurant’s Cowboy Cut, a 24-ounce USDA Prime Certified Black Angus bone-in rib-eye, sourced from Creekstone Farms and priced at $89. MB Steak, Hard Rock Hotel & Casino, 4455 Paradise Rd., Las Vegas, NV 89169, 702-483-4888. SG Bar has introduced a new menu featuring sharable plates, “15-Minute Lunches” and cocktails. Developed by PT’s Entertainment Group director of culinary operations Scott Green, the sharable dishes include adult mac & cheese in varieties of pork belly and BBQ, buffalo chicken, four cheese and wild mushroom; avocado toastettes topped with greens and poached egg; and seared salmon bites with black barley, farro and grilled vegetable succotash. The “15-Minute Lunch” special, available daily from 10 a.m.-2 p.m., includes an adult lunchable with salami, prosciutto, aged cheddar cheese, Swiss cheese, crackers and a baguette; mini sandwiches, including a classic Reuben, porchetta and Cubano; and a soup and sandwich combo. The new cocktail menu includes the Star Gazer with Bombay, St-Germain, lemon and cucumber; Spark Plug with SKYY, Kahlúa and espresso; and Cherry-Lemon Margarita with City Lights Shine Cherry Lemon, Sauza Gold Tequila, Triple Sec and sour mix. SG Bar, 9580 W. Flamingo Rd., Las Vegas, NV 89147, 702-320-4700. Twin Creeks Steakhouse at Silverton Casino Hotel will feature a three-course cowboy meal deal during the National Finals Rodeo. Priced at $45 per person and available Dec. 6-9 and Dec. 12-15, the special includes a glass of house wine; potato leek soup; 10-ounce prime hanger steak served with duck fat fried potatoes and port braised shallots; and s’mores bread pudding. In addition, half-off bottles of wine are being offered on Wednesdays and Thursdays from 5 p.m.-9 p.m. Twin Creeks Steakhouse, Silverton Casino Hotel, 3333 Blue Diamond Rd., Las Vegas, NV 89139, 702-914-8594, 866-946-4373. Sushi Roku at Forum Shops at Caesars is celebrating its 14th anniversary with several new menu items and some that are exclusive to its Las Vegas location. The former include sriracha shrimp with Champagne sauce and house-made potato chips; vegan roll with grilled eryngii mushroom, asparagus, jalapeño and almond sauce; Roku cacio e pepe with ramen, pecorino and Asiago cheese; white fish tempura with ginger/garlic/furikake-marinated skate wing; short rib bao with 5 spice-braised short rib and pickled vegetables; and carnival P.B.J. dessert encased in cotton candy, which is lit afire when served. Vegas-only dishes are Wagyu tataki with smoked hickory, truffle aïoli and sautéed shimeji mushroom; and titan roll with spicy scallop, tuna, salmon, jalapeño and miso vinaigrette. In addition, the restaurant now offers free valet parking in the Forum Valet to locals dining in the restaurant. Sushi Roku, Caesars Palace, Forum Shops at Caesars, 3500 Las Vegas Blvd. S., Las Vegas, NV 89109, 702-733-7373. Both of Rick Moonen’s restaurants at The Shoppes at Mandalay Place, RM Seafood and Rx Boiler Room, closed without prior notice on Nov. 10. According to a statement by Moonen, the closings were to allow the celebrity chef to focus on his numerous initiatives, including an off-Strip location, restaurant concept consulting, his online lifestyle network “Feast it Forward,” product endorsements, various charity events and promoting sustainable seafood as a member of the Blue Ribbon Task Force through the Monterey Bay Aquarium, for which he was a founding member. RM Seafood originally opened in 2004 as Restaurant RM and Rx Boiler Room opened in 2013. Moonen did not provide a location or timeframe for his new restaurant, nor has MGM Properties indicated what will replace the two restaurants. RM Seafood, Mandalay Bay Resort & Casino, Mandalay Place, 3930 Las Vegas Blvd. S., Las Vegas, NV 89119, no phone.